Hello, My name is Joyce, I am a mum and I thoroughly enjoyed working with babies and young children. I have over 18 years experience of supporting new born and mothers as a Postnatal maternity nurse. I am a warm, friendly, trustworthy, reliable and organised person. I am of the believe that when mothers and babies are supported correctly, they can both achieve the best outcome in terms of development of effective feeding and sleeping routine for the baby and the most precious "me" time for new mums. I love and adore children. I also enjoy reading, cooking, creative art, indoor and outdoor activities, meeting people and making new contacts. I take my responsibility seriously and respect client’s confidentiality. I am DBS checked and hold a current First Aid certificate and a clean UK drivers licence. I have over 18 years experience of undertaking the duties of maternity nurse, in a sole charge/shared care position with mother's of single and multiple babies. I help to develop a 24-hour routine for the babies by promoting effective feeding and sleeping patterns and ensuring thatI the newborn settles quickly and easily into their families routine. I fully support mothers who wants to breastfeed their babies exclusively by using techniques which helps babies to latch on correctly or by facilitating expression of milk and bottlefeeding the babies. I also show new mums techniques to use that supports the increase of breast milk production. I provide excellent support for mothers who chose mixed feeding (breastfeeding and formula) or formula exclusively. I ensure that mothers are well-looked after, by encouraging them to rest/sleep and to eat and drink properly. I ensure that the baby’s laundry is done, and the baby's room is kept clean and tidy. I also help with the purchase of essential items for the baby and provide suggestions/advise on non essentials. •	Early Years Professional Status/EYT (Level 6 qualification). •	Sign Language for Babies. •	Learning Difficulties Awareness training. I am currently available to take on new assignments. Below are the latest reviews for Joyce. Please note that reviews represent the subjective opinions of other Childcare.co.uk users and not of Childcare.co.uk. Parents must carry out their own checks and references on childcare providers to ensure that they are completely happy before enaging in the use of their services. Joyce came to join us to help with baby number 2 over a 5 week period. 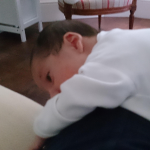 It was highly likely I wouldn't be very well after delivery and when we explained my circumstances, she took it all in her stride and offered the flexibility we needed in terms of daily approach and recommended total number of days needed each week. I have learnt so much in these past few weeks and our daughter (actually both of them) are so relaxed as a result of Joyce taking her years of experience and applying them to our family and making a unique routine to suit us. (Something you can't get from a book). She has been an absolute pleasure to have in our home and I have alaughed a lot with her! If I could keep her forever I would, our eldest adores her, our newborn has been so content, I have been calm and my husband has been able to travel for work knowing the family are happy at home. We wish her well with her future families and know she will have a positive impact on families in the future.